Kilcoe Castle was a crumbling stack, ravaged over time by the elements of Ireland’s south west coast. Bought by the multi-award winning actor Jeremy Irons, he lovingly restored it to become a habitable home, project managing the restoration himself over 20 years ago by Tim Meek. After 20 years of exposure on the South West tip of Irelands coast we found the protective lime wash had worn back to to the underlying harling leaving it vulnerable to the elements. On some of the more protected elements algae had become established and was well adhered to the surface. 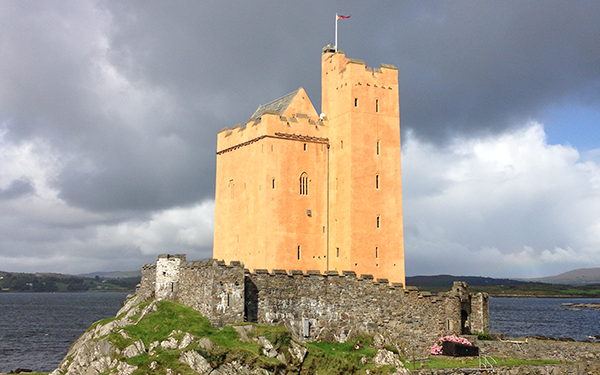 Limerich surveyed the castle, recommending Industrial Rope Access under IRATA guidelines we installed rigging points and established operating systems to undertake the works to a regimental discipline. We the gently washed the established algae and lichen growth, using low pressure hot washers to remove the algae growth and any other loose particles without damaging the lime harling. 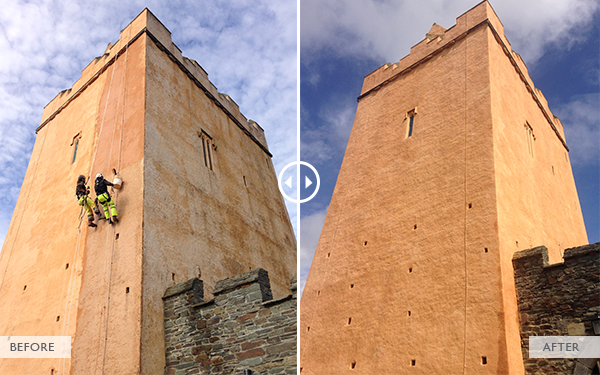 We applied 5 coats of pre-mixed and coloured lime wash to the surface ensuring each coat was well burnished. Oh, and we enjoyed dinner and good chat most evenings with Jeremy himself – terrific client! LIMERICH Ltd is a Private Limited Company registered in Scotland No. 492783. IMAGES & TEXT © COPYRIGHT LIMERICH 2016. ALL RIGHTS RESERVED.